I want to modify the timer’s time with the touch screen. 1. Read out the program in FX2N PLC with software, find the constant value K of the timer used to set the time, modify the constant K to D directly when programming, D should choose power off to keep the data register, the range is between D200-D511, and other fixed, and then write it into PLC. 2. Choose the type of touch screen, it is recommended to choose the Vinylon MT6056iv touch screen, programming with software, a numeric setting button, the button corresponding to the PLC data register D, when the finger touches the button, there will be numeric input keyboard, at this time, you can modify the timer time. In the market, any touch screen and PLC usually do not communicate well. There are four problems to be confirmed. 1, is the PLC parameter consistent with that in the project? 2, whether the communication line is connected to the pin according to the wiring diagram. 3, the project set up the COM port on the screen when the correct 4. 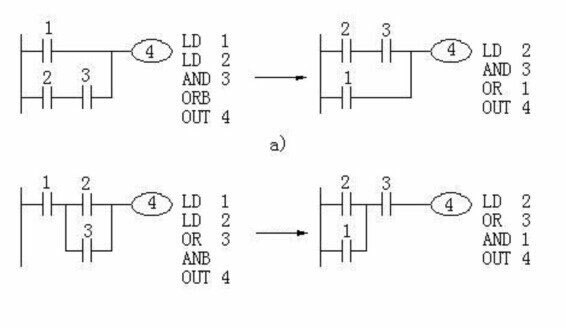 Parameters and line confirmation OK, in the case of PLC program or PLC address problem. 1. Use the programming software of PLC to connect with the PLC test to see what the parameters of PLC are and whether the parameters set in the project are consistent with the test results. 2. On-line simulation: with our configuration software, using the plc’s own communication cable and computer connection, on-line simulation to see if the project is communicating. You can use a numeric input unit or switch to operate on it, to see if the simulator is turned off and then on-line simulation before the operation is still, whether direct prompt NC. (NC and previous operations have not been written down. (test line): use the multimeter to define the test wiring according to the pin of the wiring diagram. A: parameters of touch screen. Check the parameter settings of the touch screen. There are several parameters that need special attention. 4: Interface parameters and PLC station number – ———– must be consistent with the PLC settings. B: if the parameter confirmation is set up, then check the wiring problem. 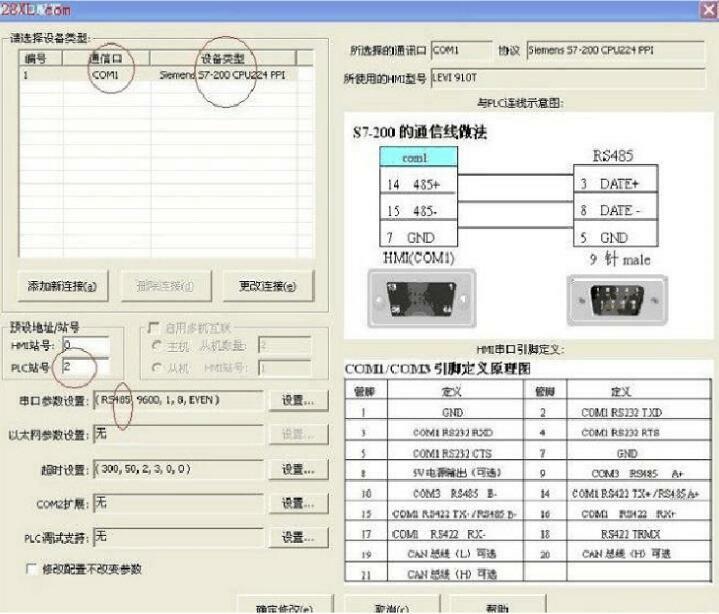 Confirm the correctness of RS485 and RS232C, and touch screen is different from all kinds of PLC wiring. This can refer to dimensional control (PLC and touch screen communication line help files). This is the basic method of normal troubleshooting communication problems. Next we will teach you how to bypass the problem of touch screen — online simulation. When communication fails, some customers guess that it may be a touch screen problem or an interface problem. Online simulation is to bypass the touch screen and connect directly to the computer with PLC. 1:PLC is connected to the computer through RS232. Some PLC have RS232 interface, some do not, and none can connect to the computer through the adapter. 2: build a simple project. Put two components, a numeric value, a numeric input. Address to set the address in PLC. 3: the setting of engineering parameters must be the same as that in PLC. 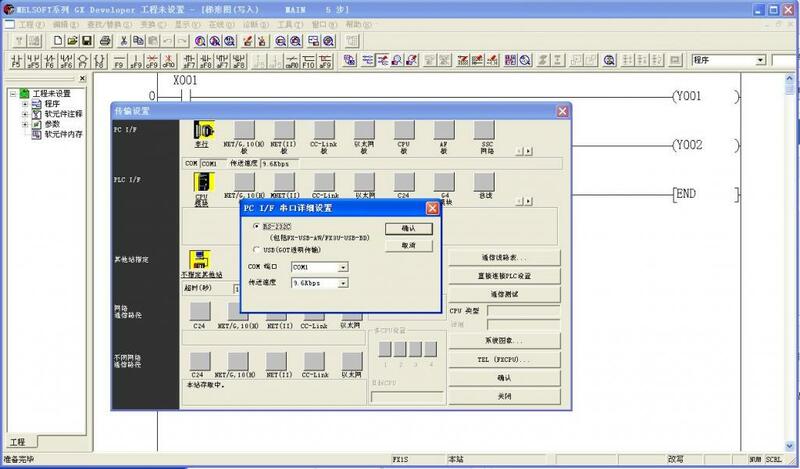 4: click on the online simulation function, so you can clearly check whether PLC can communicate with PC. If you can communicate, you can exclude the problems of PLC, and the problem of parameter setting. This entry was posted in plc program and tagged 1761-cbl-pm02 pinout, AMSAMOTIOM Plc Cable driver, counter in MITSUBISHI PLC, how to connect plc to hmi, hy01d511b manual, Learn PLC programming on September 4, 2018 by arco. PLC control DC motor: PLC output control relay, relay control contact DC contactor. This entry was posted in plc program and tagged Learn PLC programming on November 14, 2017 by arco. 2. Connect PLC. First, connect the PLC with the serial line, PLC to power, and switch to the STOP mode. 3. Software settings. Enter Gx Developer, create a new project, menu “online” – “transmission settings” – select the right COM port – click “communication test” – if successful, OK.
7.PLC switch to RUN state, programming completed! This entry was posted in plc program and tagged Learn PLC programming on October 17, 2017 by arco. 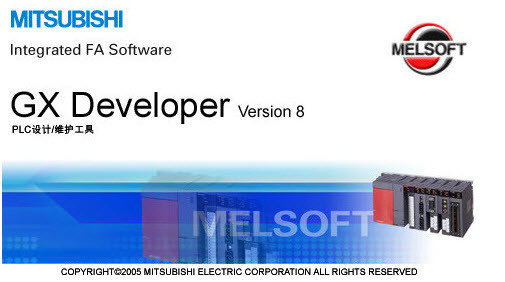 Mitsubishi PLC programming software called: GX-DEVELOPER, software installed after the call SW7D5C-GPPW or SW8D5C-GPPW. This entry was posted in plc program and tagged Learn PLC programming on October 12, 2017 by arco. What does the INCP in Mitsubishi PLC mean? INCP only to register +1, before adding a condition, connect +1. This entry was posted in plc program and tagged Learn PLC programming, Mitsubishi PLC, Mitsubishi plc INCP instruction on October 12, 2017 by arco. 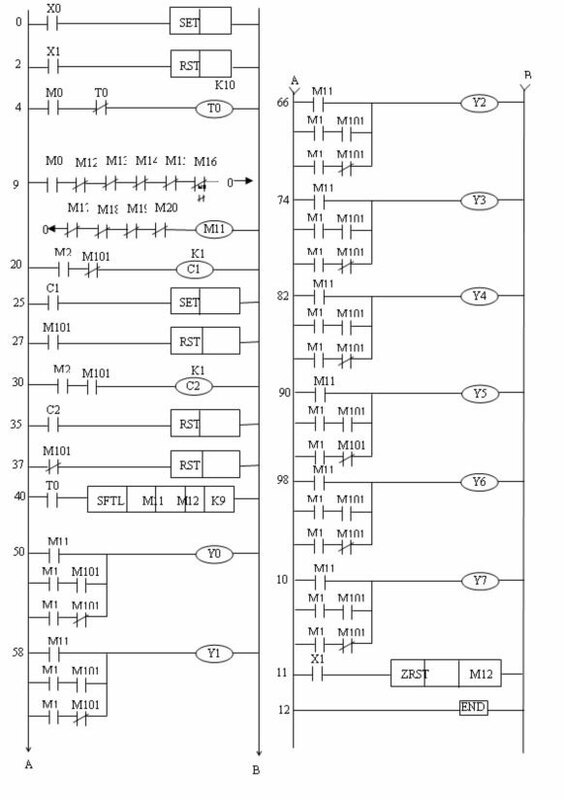 The MOVP represents the pulse transmission instruction,The h in Hoff represents the 16 binary, which represents the hexadecimal FF,K2y0 represents Y7y6y5y4y3y2y1y0, which is the two sets of 4 digits starting with Y0, and if K1y0 represents Y3y2y1y0,This directive indicates that the 16-in-system FF is delivered to the results of the y7y6y5y4y3y2y1y0 execution y7=1, y6=1, Y5=1, Y4=1, Y3=1, Y2=1, Y1=1, Y0=1. What is the meaning of MOVP in PLC? The MOV in PLC is the transmission instruction, for example [mov K15 D100] means to transfer the decimal constant K15 to register D100. MOV is continuous execution, that is, each scan cycle is transmitted once. When X0 is ON, K100 is transmitted to D10 and automatically converted to binary number. MOVP is a pulse execution, that is, the instruction is activated once, and a transfer is performed. A transfer process is performed when conditions are available. (pass constant 11 to D0 data register). It is usually performed only when there is a rising edge. It is to transmit H1A1 to module 0, buffer 0. This entry was posted in plc program and tagged Learn PLC programming, mitsubishi plc basics, movp plc mitsubishi on October 12, 2017 by arco. In the tire curing process, the capsule as the necessary parts of the tire processing, there is a high performance requirements. It needs to undergo repeated expansion and contraction, stretching and other deformation, but also experienced a sharp rise and cooling. Capsule curing is one of the key processes to obtain high quality performance, and it is also one of the most important processes in capsule production. The process is to first make the rubber material through the appropriate processing of semi-finished products, and then through the chemical effect, the semi-finished products made capsule shape, to meet the performance of the use of tire processing. Capsule curing process includes mold, mold, mold, mold, and so on. Capsule vulcanizing machine controlled by the movements of the core rod, the core rod and the main oil cylinder, combined into the core mold cavity the formation of capsule vulcanizing pressure required, at the same time through the access control to control the steam curing temperature required. Most capsule curing machine adopts hydraulic system. The hydraulic pressure station controls the upper die, the lower die and the main oil cylinder by the oil pipeline. With HOLLiAS LM series PLC analog acquisition of high precision, good ductility, network characteristics, and put forward a set of small PLC based on Hollysys capsule vulcanizing machine control system solutions. This scheme overcomes the traditional relay of capsule in curing pressure, temperature and time of the three elements of the control is not precise, high failure rate shortcomings, has a certain reference value for the application of PLC in industry capsule vulcanizing machine. According to the input and output point requirements, select the 40 point CPU module LM3109 and 4 channel analog input module LM3310. The switching input of the control system mainly includes the operation mode switching button, the setting button and the action button. The analog input of the system includes a temperature transmitter signal input and a pressure transmitter signal input. The output of the system includes a motor, an electromagnetic valve, an indicator light, etc.. Touch screen for input parameters, while monitoring the current state of operation and time. Computer as a remote monitoring equipment, can be connected with the PLC, used to save and monitor the running state of the capsule curing machine. The control system of the capsule curing machine mainly realizes the accurate control of pressure, temperature and time in each stage of curing, the fault detection and alarm, the parameter record and communication. The HOLLiAS LM series PLC designed a capsule vulcanizing machine temperature and pressure control system has high control precision, network interface and features rich, achieve a capsule vulcanizing machine, automation control and network management, greatly improving the capsule production efficiency and product quality, to meet the high quality, high efficiency, low failure rate etc.. This entry was posted in plc program and tagged Learn PLC programming on October 14, 2016 by arco. Due to the impact of GMP certification for pharmaceutical machinery industry, nearly one or two years of shrinking purchases of domestic users of the equipment, the survival problem that placed in front of the pharmaceutical equipment manufacturers is quite brutal, waiting for the market to rise again or find another way out, obviously langtaosha behind, some go to get involved in other businesses in order to life in some industries, to open up foreign markets, but all will be faced with a problem: how to attract your customers. A little experience in this paper in our machine industry, on the delta automation products in electronic tablet machine on the application. The number of medical and health care products are machine tablets (tablets, capsules, pills) after packaging and bottling equipment for grain number. Tablet machine is the highest and most commercial value of packaging machinery in the pharmaceutical and health care products. The number of speed, several pieces of machine precision, several pieces of sheet type specifications, waste elimination, or even several pieces of hardness and so on technical indicators and FDA (U.S. Food and Drug Administration) certification system to ensure the machine design and so on to determine the number of commercial value. A United States, Germany, the United Kingdom or Italy, the world famous brand high-speed intelligent electronic number of machines can be a business offer to millions of dollars. Electronic chip can be used in a number of advanced PLC programmable control technology, digital technology, modern sensor technology, computer control technology, network technology in one, to achieve human-computer interaction interface, easy to operate and reliable. Automatically complete the bottle, counting, filling, bottle and other processes, widely used in medicine, chemical industry, food industry, tablets, pills, tablets, capsules and tablets of the filling. This project is divided into single channel, dual channel, multi-channel. Each channel is generally composed of 8 sets of optoelectronic components, each bottle of medicine is completed by a channel. In order to improve the yield, the machine can be developed into a single or multiple head models, but the principle is the same, are composed of several parts shown in Figure 1: electromagnetic vibration feeding device, pneumatic closing device, automatic counting system, centralized monitoring and sorting system. After the system works automatically, the position of the pre installed bottle is correctly judged by photoelectric. When all the signals are correct, the vibration feeding system will start after receiving the signal. The vibration system is divided into three stages: the first stage is to discharge the vibration, slow feeding, three for feeding channel packaging. After three stages of adjustment, in order to achieve the material uniformity, the number of grains accurate, strong adaptability. When the tablets during the process of falling through several pieces of photoelectric switch, automatic counting system will send a signal to the sorting system (PLC), then PLC will quickly control the movement of the cylinder according to the number of cans set by the user, to achieve real-time closed, to achieve accurate canned to improve system stability and accuracy. All counting machine parameters and operation conditions, will be through the monitoring system — delta human-machine interface to the working condition of inspection. Including the cylinder action time, automatic number of pieces of the system is normal or not will be clear at a glance. The system requirements for PLC is very high, the requirements of the PCL has 100 1ms of the timer, the program in a timely manner, the scanning period is short, the control stability and other characteristics, and the product has a high price advantage. According to these characteristics, the project adopts delta high performance EH series programmable controller (DVP64EH00T). The controller has dual communication port, convenient programming and monitoring; at the same time there are 100 1ms timer (similar products unique), can be more accurate, the number of fast measurement of several pieces, and the scan cycle of PLC is very short, in the same function of products, leading the industry. The monitoring interface using the intelligent man-machine touch screen multi delta communication port (DOPA57GSTD), the product with its powerful communication function, more deeply to win customers free communication, strong macro function, solves the problem of the industry. Through the function of both the size of the pills or thin, as long as a light correction through man-machine interface, the system will automatically record, and the optimal parameters automatically stored in the screen. The core control system uses a set of delta products, tablet counting machine in the overall price, better than that of European and American products, rather than on the same brand. I am now a lot of online publicity to spend hundreds of pieces of information to buy some of the information can get a monthly salary of tens of thousands of monthly salary, the first: the light to see the data video you are not learning PLC, unless you have an IQ of 250. Second: General engage in PLC can not get so high wages, of course, some of the high level of the exception. But you do not have to be discouraged, if you want to engage in industrial control, PLC is necessary to master, as well as wages to see your standard, and efforts will be rewarded. For the beginner a PLC entry is not the biggest difficulty how to learn programming, not how to make a motor to rotate (these things everywhere, but how to find the answer). The sensor switch motor access system, and how to connect the PLC, how to set the program, including how to understand the various components such as sensor switch. The motor and so on, these are the details of things, but this is for beginners very confusing thing, no one will be confident for beginners a fatal blow, but these books basically can not find or do not sum up. All of it to learn the most important is the practice of PLC. I summed up the following several ways to learn PLC, a total of your reference, mainly depends on their own situation. 1: you have to get ready for a few things. Self time may be Y output on the line, but in the device if the Y has been output, the cylinder may have been straight back, it should be the actual test for how long it is good. programming ideas clear point, if one way does not work, another way to try, not to engage in a little clever or stupid way. To the scene of the debugging, the most flexible and most critical, because we are staring at it, do not go to a dead way. Which is the quickest way to solve the problem, what kind of. On the back of the scene to meet the problems and then review, if you can not solve the problem, go home to study or consult others. At the same time, but also to learn more content, but relatively speaking, the difficulty of those things is less than PLC, learning is also very fast. The book is likely to be a self. In practice, will use a lot of strange instructions or do not understand the function, while learning progress quickly. Continue to practice, and constantly overcome difficulties, and gradually learn more deeply. 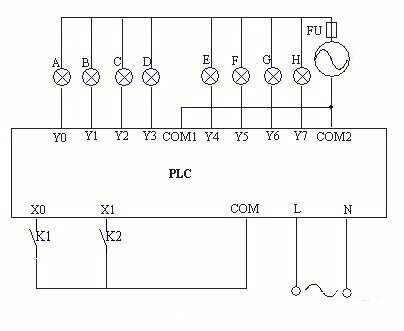 PLC how to learn, how to learn for beginners PLC? Since all of the PLC programming is not interested, then how can learn it. So it can be programmed as an interesting intellectual game, this will cause you to have enough patience and perseverance to complete the program. PLC learning to focus on practice, there is no practice is absolutely not good. This is also the most critical learning PLC. So when programming need as practice object PLC and related hardware equipment, it can also program intuitive response with the actual equipment action in the detection procedure, so that the error action of equipment can easily find the point of failure, or no control object, fault point to analysis, to program it is difficult to judge the correctness of. In the preparation of procedures, the use of the intermediate relay to have the order and rules, otherwise the program will be very disordered, and in the future of the program changes and their troubles. At the same time, in the preparation process, the every step, the role of each signal and the intention to mark, so you know your own programming every step of the intention, and in the process of looking back at a glance. PLC application and its wide range, its control function is also changing, and peer exchanges can promote the development of knowledge, and in the exchange process can reflect their own shortcomings. At the same time when you encounter problems, the exchange is particularly important, they do not understand the technology, there may be a little hint, it will become very simple to solve. Finally, on the network at present there are a lot of PLC learning materials and related technology, can understand the relevant technology through the network, so you can have to understand the various techniques for later use when targeted learning. Will start switch K1 close, eight lighting light at the same time, namely abcdefgh light at the same time a second, then eight lighting according to counter clockwise rotate the light seconds, a bright 1s > b 1s > C bright bright 1s > d 1s > e bright bright 1s > f light 1 second g > bright 1s > h light 1 second; next eight lighting and light at the same time 1: abcdefgh and light 1 second; and eight lighting according to clockwise rotate the light 1 second, namely h bright 1 g > light 1 second > f light 1 second, e light in the 1s > d 1s > C bright bright 1s > B bright second, a bright light for 1 second. Then repeat the execution in this order. Press the stop switch K1, all the lights off. 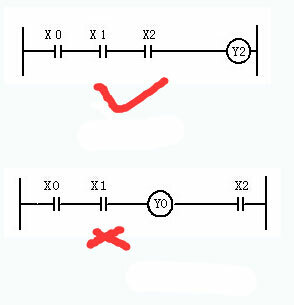 According to figure 7 to meet the good line. Note that the COM1 and COM2 are connected, as the same as the rated voltage of the indicator light. Input and then start switch and stop switch. 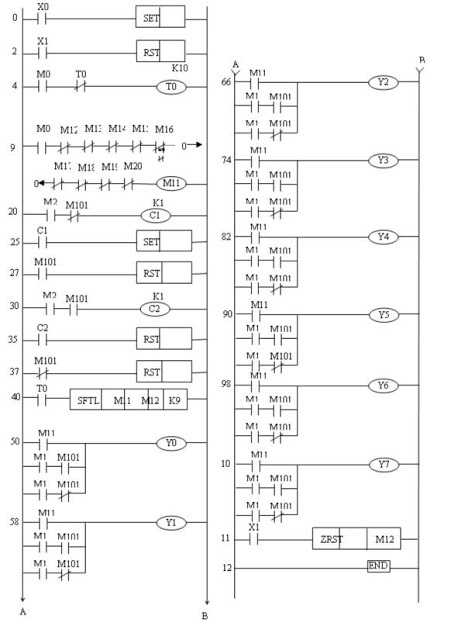 Figure 8, PLC operation, the program 9 to 19 step, M11 conduction, due to the step program of 50 to 120, M11 dynamic contact closure, respectively control the Y0 Y7 conduction and lantern abcdefgh lit up at the same time, the due t0 delay 1 seconds, so the abcdefgh lit up at the same time 1 seconds. To 1 seconds, the program step 40 t0 dynamic contact closure, shift instruction execution, implementation turns light, namely abcdefgh turns light, because a second clock t0 closed once, so abcdefgh turns light interval for a second. Step 20 to 29, when the M20 pass, the M101 set, the M101 moving contact with MI2 ~ M19 moving contact with the contact, respectively, turns lit H ~ A, that is, G, F, H, E, D, C, B, A turns lit every second. Step 30 to 39, when the M20 pass, the M101 reset, M101 dynamic break contacts with MI2 ~ M19 dynamic contact contact, respectively, in series lit A ~ H, that is, A, B, C, D, E, F, H, G turns lit every second. At any time will stop the switch K2 closed, in the 114th step, the interval reset command so that M19 ~ M12 all reset, all the lights are not bright. (1) the ladder diagram program is entered into the computer, check the power supply is correct. (2) to debug the program. A. connected to the PLC power supply, the PLC will be RUN state, the K1 closed, observation of A, B, C, D, E, F, G, H, the light show. K2 will be closed, A, B, B., C, D, E, F,, G, H, the light show. This entry was posted in plc program and tagged Learn PLC programming, PLC programming, plc training courses on August 12, 2016 by arco. (3) In addition to stepping procedure, any coils, timers, counters, and other advanced instruction can not be directly connected to the left bus bar. (4) In the process, does not allow the same number twice coil output (dual coil output). The following ladder is not allowed. 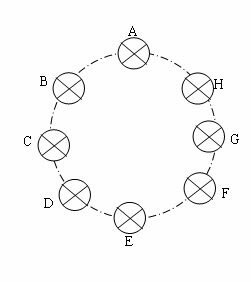 (5) does not allow the bridge circuit. (6)Shall be prepared by the sequential program from top to bottom, from left to right to prepare the way. To reduce the number of steps in the implementation of the program, the program should be to the left and right big small big small. 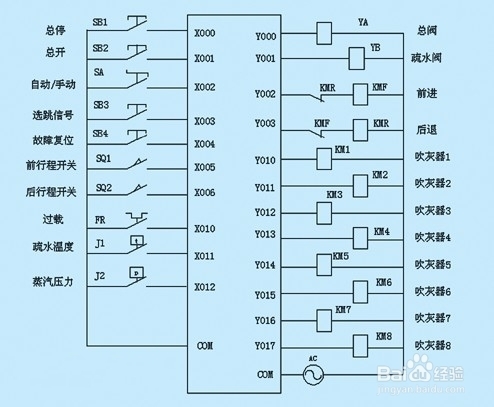 In the traditional relay – contactor control diagram and typical PLC based control circuit, based on the experience accumulated translation, revised and improved to give final control procedures. This entry was posted in plc program and tagged Learn PLC programming, plc courses, PLC programming, plc programming tutorial on August 12, 2016 by arco.